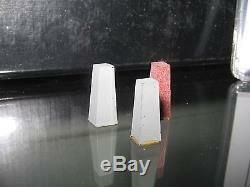 For sale 3 original screen used Death Star tower miniatures. This were actually filmed and are visible on screen and are not only production used as those in previous auctions. Glue residue is still present at the base of all the models after removing them from the model surface when filming was finished. They are only 1.5 cm tall. One is in red color. You can see them in the sequence when the Super Star Destroyer crashes on the surface of the Death Star in ROTJ. Original Star Wars props, especially miniatures are getting very popular. COA is from Propstore of London. 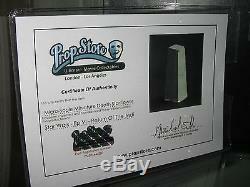 The item "Star Wars ROTJ Filming Miniature Death Star Tower Models Screen Used COA" is in sale since Thursday, January 05, 2017. This item is in the category "Entertainment Memorabilia\Movie Memorabilia\Props\Originals". The seller is "x-video" and is located in Albignano. This item can be shipped worldwide.